Seoul-based media giant CJ ENM reiterated April 17 that it is not taking an acquisition of Dexter Studios into consideration, months after a previous denial in January. “(CJ ENM) is not pursuing an acquisition of Dexter Studios,” CJ ENM said in a regulatory filing April 17. 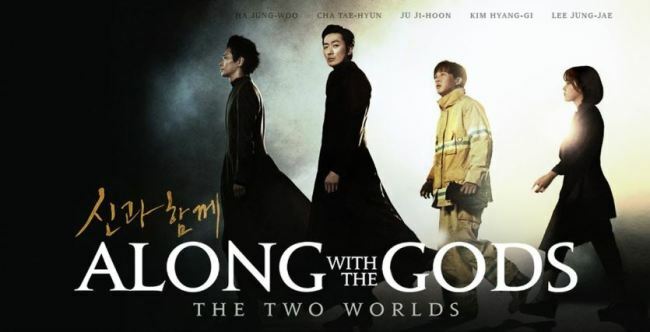 A promotional image for "Along with the Gods: The Two Worlds," which received investment from Dexter Studios. The disclosures came as the Korea Exchange on April 16 ordered both CJ ENM and Dexter Studios to explain rumors or media reports before April 17 at noon. On April 16, a local media outlet reported that CJ ENM will secure an acquisition deal by June and complete the transaction as early as in September. Dexter Studios, trading on the second-tier bourse Kosdaq, hit the price ceiling the same day following the news. Its stock price severely fluctuated, drifting down 15.7 percent in closing from the previous day on April 17. In January, CJ ENM denied rumors that it had been planning to buy Dexter Studios. The company made a turnaround in 2018, logging a net profit of 2.8 billion won ($2.5 million) and 2.1 billion won in operating profit, from a net loss of 34.2 billion won and 21.9 billion won in operating losses for 2017.